For Property Options in Punjab, Click here." What should be taxed and what not to mobilise additional resources required to gear up the tempo of development and to provide basic services to people? The Badal government is facing a dilemma in this regard. Failure to adhere to the prescribed procedure for the sanction of counter insurgency (CI) allowance has resulted in the Air Force paying irregular grant amounting over Rs 41 crore to IAF personnel. AIADMK general secretary J. Jayalalithaa has said that the Third Front would not support Pratibha Patil, the UPA’s nominee for the presidential election. 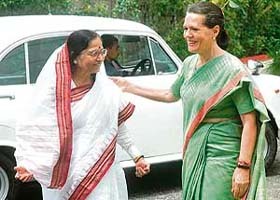 POWER LADIES: Congress president and UPA chairperson Sonia Gandhi welcomes Presidential nominee Pratibha Patil at her residence in New Delhi on Saturday. Will corporatisation of retail trade benefit common man? Bolstered by its success in the selection of UPA presidential nominee, the CPM today warned the UPA government to trudge carefully on the nuclear deal with the USA or face serious consequences. CPM polit bureau member Sitaram Yechury warned that the “UPA government is on test” on the civilian nuclear cooperation with the USA. After an anxious wait, 10 Indian hostages were freed in Nigeria after they had been seized by mercenaries on June 1 in the oil city of Port Harcourt. Three of them are employees of the Indonesian firm Indorama and the others members of their families. Mahendra Singh Dhoni and Yuvraj Singh were today promoted to grade A while Virender Sehwag, Harbhajan Singh, VVS Laxman and Irfan Pathan were demoted to grade B in the BCCI’s graded payment system. So, how much is your dad worth? 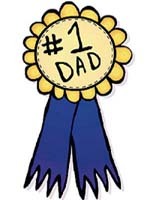 How much is a dad worth? Almost 13,000 pounds per year, according to new research. The work fathers do around the home — from being a part-time taxi driver to sports coach and gardener — save a family 12,914 pounds per year, according to insurer Friends Provident. Chandigarh Judicial Academy, set up early this year for training of judicial officers of both Punjab and Haryana, has in its inaugural year been caught in a serious controversy over the purchase of books from a local bookseller for its library. 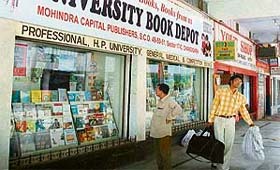 BULK SUPPLIER: Mohindra Capital Publishers of Sector 17.